In the life of the Christian, the day is punctuated by set times of prayer. There are seven in total, reflecting the ancient and biblical understanding of the number seven as a sign of completion and perfection. This cycle of prayer is known as the Divine Office, and can be thought of as an ongoing conversation of prayer between God and humankind that has continued uninterrupted for centuries. The Divine Office forms the foundation of the life of monasteries, so much so that no fewer than twenty chapters of the Holy Rule of St Benedict are dedicated to it. For lay people, living and working in the world, praying all seven offices each day may be a challenge, and it might be that we manage only one or two offices as part of our morning and evening prayers, but each time we pray the Office, we enter into this conversation, if only for a time, along with the saints who have gone before us throughout the ages, and with our sisters and brothers in Christ around the world. In this way, through regular prayer, we strengthen our communion with God and each other. Since earliest times, Christians have marked the new day with the going down of the sun. This is an inheritance from the Old Covenant which continues to our own day. As darkness begins to fall and the current day draws to a close, we turn our hearts with expectation to the Christ Who is to come, scattering the darkness with his radiant light. Every evening, Christians greet the liturgical celebration of the coming day with the office of Vespers, which forms the main evening offering of worship. This takes the form of the singing of a number of psalms, which vary from one day to the next. Each of the psalms is introduced and concluded with a short antiphon, which is related to the feast, saint, or mystery being celebrated. Also included in Vespers are various prayers and responsories, as well as the hymn Phos Hilaron, which is one of the most ancient of Christian hymns in continuous use, dating to at least the 2nd century. we praise God: Father, Son and Holy Spirit. O Son of God, Giver of Life. Therefore all the world glorifies You! Amen. The other pivotal office of the day comes at sunrise. In the office of Lauds, we give praise to our Creator for the gift of the new day and for all of his goodness. This office of morning praise takes its name from the psalms of praise (Psalms 148, 149, and 150), that are sung at every celebration of this office. 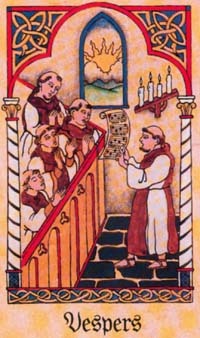 A distinctive part of Lauds is the singing of a biblical canticle, which varies from one day to the next. Together, Vespers and Lauds mirror the evening and morning raising of incense in the Temple in Jerusalem under the Old Covenant. 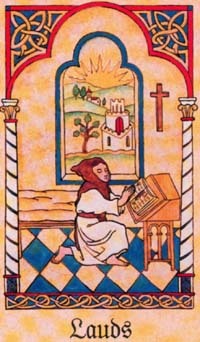 The little hours are short offices of psalms and prayers that are prayed during daylight hours. They are named after the times of day that they are customarily prayed, (assuming a standardised time of sunrise at 6am for convenience). Terce - The Third Hour, being 9am. Sext - The Sixth Hour, being noon. None - The Ninth Hour, being 3pm. Together with Compline, these form ideal prayers to be said throughout the day individually or as a group, or as a family at home. Compline is the final office of the day, prayed immediately before retiring to bed. For this reason, it is largely unvarying, with the psalms and prayers being the same from day to day. 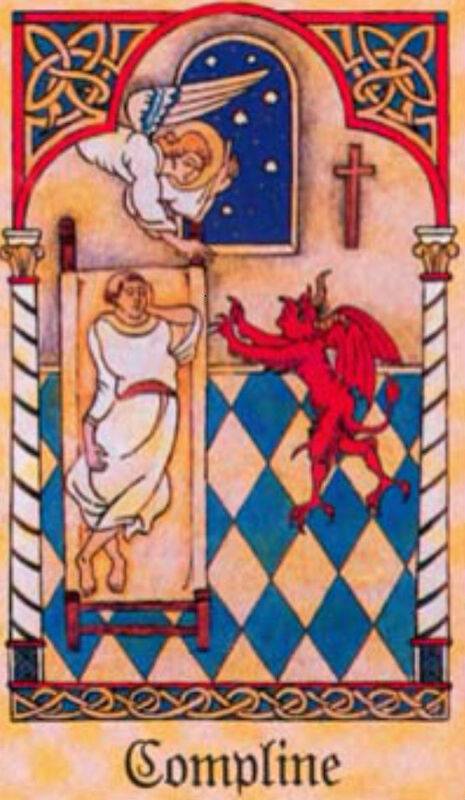 In the office of Compline, we turn our minds to our rest, asking for God's protection, both during our rest in the coming night and also as we prepare to take our final rest in the grave, as we await the resurrection. In monastic houses, in keeping with St Benedict's Rule, strict silence is kept from the end of Compline until morning. This office of readings and meditation is usually prayed in monastic houses in the night hours. However, on certain feasts, such as Christmas and Pascha, Vigils takes its place among the regular worshipping life of a parish.